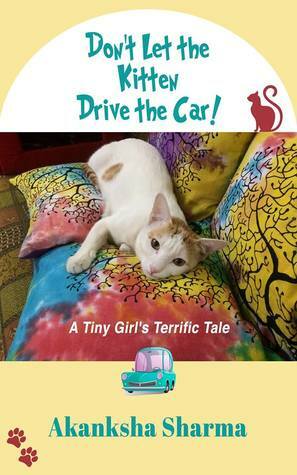 Don't let the Kitten drive the car is a debut book of Akanksha Sharma. The story revolves around a cat and a visually impaired girl. I don't understand the title's relationship with the story. Also, the cover page is not up to my marks. But as they say, never judge a book by its cover. In this case, it proves correct. The story is awesome. Akanksha Sharma did a great job in her first book. A street cat name Simba got shelter in Gupta's house where he became Akriti's best friend. Akriti Gupta is 10 years old and visually impaired. The story is about their friendship and the struggle they face. Akriti try to fit in a new school while Simba in a new home. The author further describes the technologies which makes Akriti's life much better. The way how to handle a cat is the best part to read. (PS - I'm a dog lover.) But the author gives a fresh look out into this subject. I sometimes feel that the characters of Akriti and her friends Prateek and Sumaira are very well matured which bothers me a little because they were only 10. Akriti handles almost every difficult situation including school bullies and impolite neighbors. Simba's style makes everyone happy in the house including the readers. The story hooks me from start to the end. The subject of the story reflects the social norms and abusive animal's pain. The language is simple, and narration is flawless. There are a few errors which can be ignored, but I don't like the Hindi instances in the middle of the story. I suggest to the author if she ever uses the Hindi language make sure that you give a proper English translation as well. Overall, I adore this cute, simple, and thoughtful story. This book is for all age groups. It's a light, short, and fun read. I highly recommend this book. PS - All the proceedings from the book sale will be donated in charity by the author. So please buy this book. You won't regret it.